October is breast cancer awareness month. Bali Intimates will donate $1 to the Breast Cancer Research Foundation each time someone plays Bali Blitz on their Facebook page. It’s a win win situation. How To Play: Click HERE, hit “begin a game” and play! Have FUN! Make sure to come to our Facebook Page to let us know what you win! Enter now through September 5th, at the BareMinerals by Bare Escentuals Facebook page, “like” them, and then fill out your information to enter in the BareMinerals BareSkin Sweeps! *Win 1 of 5,000 BareMinerals bareSkin Foundation deluxe samples that will be given away! Win Purdue Chicken for a Year! 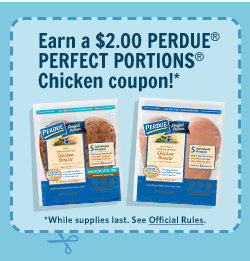 Through the end of May, The Perdue Crew will be giving away excellent coupons and prizes including ‘Kitchen Kits’ and a year’s supply a chicken. Click Picture above and sign in with your Twitter or Facebook. You can also get a FREE Perdue Kitchen Kit! (Only 1000 available), just click picture above and refer 4 friends! Win Coffee for a Year! Enter to win Coffee for a Year! Win a Free ski trip from Fireball Whiskey hurry ends January 1, 2014. Be sure to check us out on Twitter! Sephora is giving away a 3-day trip for 2 to L.A. and a $1000 Kat Von D beauty shopping spree at Sephora, which is a total value of $3000!!! six runner-ups will receive a prize featured in the picture below. Ends July 8th 2013. Be sure to follow us on twitter! !